Cloud Expo 2017: What’s New in Cloud Technology? In the digital age, technology is continuously developing and all businesses need to adapt to remain competitive. Cloud Expo 2017 provided the perfect opportunity for itelligence to discuss emerging cloud trends with other industry professionals and have its say on how this technology will shape the way we work in the future. Scalable, customizable storage for business is currently one of the most pressing issues in cloud computing. Agreeing with itelligence on this are the companies Cloudian and Netapp, who exhibited on the topic. So why has the focus shifted to this trend and why is it so important in the modern business climate? Many modern cloud solutions are effectively a blank canvas, initially without any data or predefined structure. This allows organizations to add to their infrastructure as required and expand the platform in line with the demands and growth of the enterprise. Not only does this mean that companies can tailor their cloud architecture to their needs, it also helps them avoid the potential restrictive situation of vendor lock-in. These types of flexible solutions can be built on as and when needed, therefore avoiding dependence on a single provider. The leading business cloud event, Cloud Expo Europe, took place in Frankfurt on the 28th and 29th of November, 2017. The exhibition was comprised of many insightful features, such as seminars, new product promotions, and demonstrations. On site, we took the chance to exchange ideas with other thought leaders from the industry. The expo provided the perfect platform to define the challenges facing modern businesses and how cloud experts, such as itelligence, can turn them into business potential. The exhibition was extremely diverse, with a large variety of cloud providers showcasing their innovative developments and services. Some of the organizations we got to hear from and speak to were the leading hardware manufacturer Samsung, the cloud provider Citrix, and, of course, NTT Communications, a division of itelligence’s parent company NTT DATA. 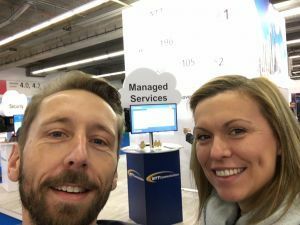 Ingo Jochim, Senior Consultant and Maria Barta, Service Manager at itelligence, in attendance at Cloud Expo 2017. Together with my colleague Maria Barta, I represented itelligence at this event. As a senior cloud consultant, I believe it is vital to stay up to date with changes in the industry in order to reduce the total cost of ownership for IT infrastructures and minimize time spent maintaining the architecture. Cloud Expo 2017 was a fantastic chance to network with other professionals regarding what’s new in cloud technology. Only by understanding how the challenges of our customers are changing can we provide the best possible service to help them overcome them. Overall, the event was hugely useful for us. It provided the opportunity to share clear insights into how business challenges, such as the increasingly complexity of data management, are transforming the way organizations operate and how the cloud provides effective solutions for this. With the current focus being on flexible storage, itelligence ensured that it is focused on giving its customers what they need to reduce costs and improve IT infrastructure management. Additionally, we found out more about what other companies are doing, therefore gaining a more detailed understanding of the current market situation. Ingo Jochim has worked for itelligence as Senior Architect in Dresden since 2010, focusing on implementation and automation of large cloud environments. Ingo has more than 15 years experience in data center operations and likes Enduro off-road races.